JetBlue Airways is launching a big new ad campaign from Mullen with the theme "Air on the Side of Humanity." But its big star isn't even human—he's a pigeon. 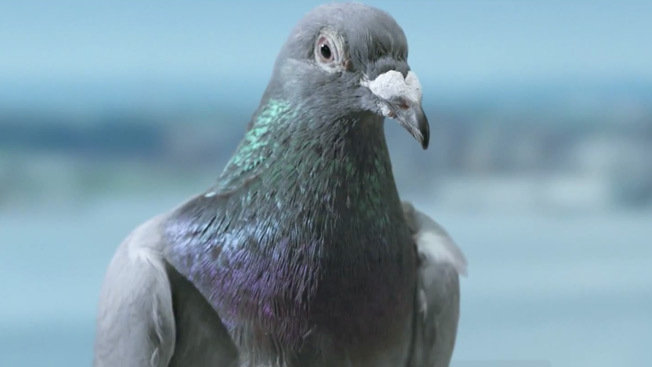 The 60-second launch spot is a documentary-style piece in which the pigeon—that most frequent of frequent fliers, and most underappreciated of birds—talks about how he flies in crowded spaces, gets crumbs for snacks and is generally ignored. Thus, he's a stand-in for the masses who, with ruffled feathers, shuffle onto rival planes and experience the worst of air travel. "There's got to be a way to fly with a little respect. You know?" our hero asks at the end, as the tagline appears on screen. The campaign breaks first in Boston, where JetBlue has the most daily nonstop flights of any carrier, and includes TV spots (running in 39 prime-time season premieres), online advertising, microsites, mobile, social, experiential and out-of-home advertising. Most intriguingly, JetBlue is also partnering with Mobile Theory on a voice activation unit that will teach consumers "how to speak pigeon on their smartphones." There's also a digital experience and social hub called Central Perch, where you can send messages to friends through virtual carrier pigeons on Facebook. Meanwhile, check out the launch spot and credits below. Spot: "Air on the Side of Humanity"